The Geographica (Ancient Greek: Γεωγραφικά Geōgraphiká), or Geography, is an encyclopedia of geographical knowledge, consisting of 17 'books', written in Greek by Strabo, an educated citizen of the Roman Empire of Greek descent. Work can have begun on it no earlier than 20 BC. A first edition was published in 7 BC followed by a gap, resumption of work and a final edition no later than 23 AD in the last year of Strabo's life. Strabo probably worked on his Geography and now missing History concurrently, as the Geography contains a considerable amount of historical data. Except for parts of Book 7, the complete work is known. A page from Isaac Casaubon's 1620 edition of Geographica. The page numbers prefixed by C are currently being used as a standard text reference. There are 840 pages; the coat of arms displayed are in honor of Louis XIII of France. geōgraphia, "description of the earth"
chōrographia, "description of the land"
periodos gēs, "circuit of the earth"
periodeia tēs chōrās, "circuit of the land"
It is the sea more than anything else that defines the contours of the land (geōgraphei) and gives it its shape, by forming gulfs, deep seas, straits and likewise isthmuses, peninsulas, and promontories; but both the rivers and the mountains assist the seas herein. It is through such natural features that we gain a clear conception of continents, nations, favourable positions of cities and all the other diversified details with which our geographical map (chorographikos pinax) is filled. From this description it is clear that by geography Strabo means ancient physical geography and by chorography, political geography. The two are combined in this work, which makes a "circuit of the earth" detailing the physical and political features. Strabo often uses the adjective geōgraphika with reference to the works of others and to geography in general, but not of his own work. In the Middle Ages it became the standard name used of his work. The date of Geographica is a large topic, perhaps because Strabo worked on it along with his History for most of his adult life. He traveled extensively, undoubtedly gathering notes, and made extended visits to Rome and Alexandria, where he is sure to have spent time in the famous library taking notes from his sources. If one presumes that Strabo acquired the motivation for writing geography during his education, the latter must have been complete by the time of his next visit to Rome in 35 BC at 29 years old. He may have been gathering notes but the earliest indication that he must have been preparing them is his extended visit to Alexandria 25–20 BC. In 20 he was 44 years old. His "numerous excerpts" from "the works of his predecessors" are most likely to have been noted at the library there. Whether these hypothetical notes first found their way into his history and then into his geography or were simply ported along as notes remains unknown. 20th century drawing of Augustus. Most of the events of the life of Augustus mentioned by Strabo occurred 31–7 BC with a gap 6 BC – 14 AD, which can be interpreted as an interval after first publication in 7 BC. Then in 19 AD a specific reference dates a passage: he said that the Carni and Norici had been at peace since they were "stopped ... from their riotous incursions ...." by Drusus 33 years ago, which was 15 BC, dating the passage 19 AD. The latest event mentioned is the death of Juba at no later than 23 AD, when Strabo was in his 80's. These events can be interpreted as a second edition unless he saved all his notes and wrote the book entirely after the age of 80. An outline of the encyclopedia follows, with links to the appropriate Wikipedia article. Pages C1 through C67, Loeb Volume I pages 3–249. I.1 1 Geography is a branch of philosophy. 2 Homer is the founder of geography. 5 The Isles of the Blessed. 7–9 Tides of the Ocean. Earth is an island. 10 The Mediterranean, the land of the Cimmerians, the Ister. 12 Hipparchus and the climata. 14–19 The ecumene. Geography requires encyclopedic knowledge of celestial, terrestrial and maritime features as well as natural history and mathematics and is of strategic interest. 20 Earth is a sphere with surface curved by the law of gravity, that bodies move to the center. 21 Knowledge of geometry is required to understand geography. 22–23 The purpose and plan of the encyclopedia. Representation on a modern map of Iberia according to Strabo. Some thirty manuscripts of Geographica or parts of it have survived, almost all of them medieval copies of copies, though there are fragments from papyrus rolls which were probably copied out c. 100–300 AD. Scholars have struggled for a century and a half to produce an accurate edition close to what Strabo wrote. A definitive one has been in publication since 2002, appearing at a rate of about a volume a year. ^ Dueck, Daniela (2000). Strabo of Amasia: A Greek Man of Letters in Augustan Rome. London, New York: Routledge: Taylor & Francis Group. p. 145. ISBN 0-415-21672-9. ^ Book 3 chapter 1 section 1 1st sentence, page C136. ^ Book 3 chapter 4 section 5 last sentence, page C158. ^ Book 6 chapter 1 section 2, page C253. ^ Book 9 chapter 5 section 14, page C435. ^ Book 2 chapter 5 section 17, page C120, Jones translation. ^ Ad. Att. 2. 6. 1. ^ Sterrett, Loeb Edition, pages xxii–xxiii. ^ Sterrett, Loeb Edition, page xxvii. ^ Dueck page 146 on Strabo Book 4, Chapter 6, Book 9, page C206. ^ Book I sections 22–23. ^ Strabo rotates the Pyrenees to form the east side of Iberia, which is correspondingly distorted. ^ In fact adjacent Cape St. Vincent is further west but Sagres Point was the Sacred Cape. Kramer, Gustav, ed., Strabonis Geographica, 3 vols, containing Books 1–17. Berlin: Friedericus Nicolaus, 1844–52. Strabo (1917–1932). Horace Leonard Jones (ed.). The Loeb Classical Library: The Geography of Strabo: in Eight Volumes. Translated by Jones; John Robert Sitlington Sterrett. Cambridge, Massachusetts/London: Harvard University Press/William Heinemann. ISBN 0-674-99055-2. Contains Books 1–17, Greek on the left page, English on the right. Sterrett translated Books I and II and wrote the introduction before dying in 1915. Jones changed Sterrett's style from free to more literal and finished the translation. The Introduction contains a major bibliography on all aspects of Strabo and a definitive presentation of the manuscripts and editions up until 1917. Tardieu, Amédée (1886). Géographie de Strabon: Traduction Nouvelle: Tome Premier (in French). Paris: Librairie Hachette. Books I – VI only. Tardieu, Amédée (1873). Géographie de Strabon: Traduction Nouvelle: Tome Deuxième (in French). Paris: Librairie Hachette. Books VII – XII only. Radt, Stefan (Translator, Critical Apparatus) (2002–2011) Strabons Geographika. Göttingen: Vandenhoeck & Ruprecht. Books I–XVII in ten volumes. Strabo (1924). H.L. Jones (ed.). 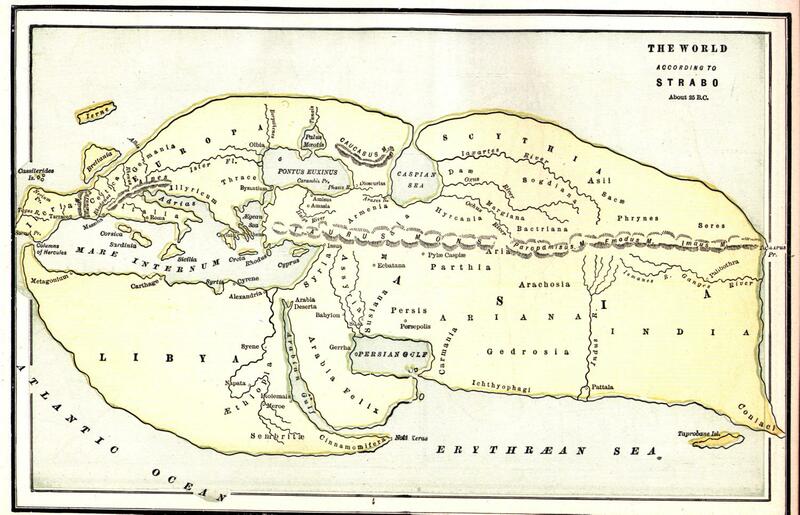 "Strabo: The Geography". LacusCurtius. Translated by Jones. Retrieved 2007-11-03. Strabo (1924). H.L. Jones (ed.). "Strabo, Geography". The Perseus Digital Library. Tufts University. Retrieved 2007-11-03. Books 6–14. Strabo (1903-06-19). H.C. Hamilton; W. Falconer (eds.). "Strabo, Geography". The Perseus Digital Library. Tufts University. Retrieved 2007-11-03. Strabo (1852–53). A. Meineke (ed.). "Strabo, Geography". The Perseus Digital Library (in Greek). Tufts University. Retrieved 2007-11-03. Books 6–14. Acta Geographica Slovenica is a biannual peer-reviewed scientific journal of geography published by the Anton Melik Geographical Institute covering human geography, physical geography, and regional geography. The editor-in-chief is Blaž Komac (Anton Melik Geographical Institute). It was established in 1952 as Acta geographica/Geografski zbornik. In 2002 it merged with Geographica Slovenica, obtaining its current title reflecting this merger in 2003. The Atlas Maior is the final version of Joan Blaeu's atlas, published in Amsterdam between 1662 and 1672, in Latin (11 volumes), French (12 volumes), Dutch (9 volumes), German (10 volumes) and Spanish (10 volumes), containing 594 maps and around 3,000 pages of text. It was the largest and most expensive book published in the seventeenth century. Earlier, much smaller versions, titled Theatrum Orbis Terrarum, sive, Atlas Novus, were published from 1634 onwards. Like Abraham Ortelius's Theatrum Orbis Terrarum (1570), the Atlas Maior is widely considered a masterpiece of the Golden Age of Dutch/Netherlandish cartography (approximately 1570s–1670s). Geographic tongue, also known by several other terms, is an inflammatory condition of the mucous membrane of the tongue, usually on the dorsal surface. It is a common condition, affecting approximately 2–3% of the general population. It is characterized by areas of smooth, red depapillation (loss of lingual papillae) which migrate over time. The name comes from the map-like appearance of the tongue, with the patches resembling the islands of an archipelago. The cause is unknown, but the condition is entirely benign (importantly, it does not represent oral cancer), and there is no curative treatment. Uncommonly, geographic tongue may cause a burning sensation on the tongue, for which various treatments have been described with little formal evidence of efficacy. Three European Union schemes of geographical indications and traditional specialties, known as protected designation of origin (PDO), protected geographical indication (PGI), and traditional specialities guaranteed (TSG), promote and protect names of quality agricultural products and foodstuffs. Products registered under one of the three schemes may be marked with the logo for that scheme to help identify those products. The schemes are based on the legal framework provided by the EU Regulation No 1151/2012 of the European Parliament and of the Council of 21 November 2012 on quality schemes for agricultural products and foodstuffs. This regulation (enforced within the EU and being gradually expanded internationally via bilateral agreements between the EU and non-EU countries) ensures that only products genuinely originating in that region are allowed to be identified as such in commerce. The legislation first came into force in 1992. The purpose of the law is to protect the reputation of the regional foods, promote rural and agricultural activity, help producers obtain a premium price for their authentic products, and eliminate the unfair competition and misleading of consumers by non-genuine products, which may be of inferior quality or of different flavour. These laws protect the names of wines, cheeses, hams, sausages, seafood, olives, olive oils, beers, balsamic vinegar, regional breads, fruits, raw meats and vegetables. Foods such as Gorgonzola, Parmigiano-Reggiano, feta, the Waterford blaas, Herve cheese, Melton Mowbray pork pies, Piave cheese, Asiago cheese, camembert, Herefordshire cider, cognac, armagnac and champagne can only be labelled as such if they come from the designated region. To qualify as roquefort, for example, cheese must be made from milk of a certain breed of sheep, and matured in the natural caves near the town of Roquefort-sur-Soulzon in the Aveyron region of France, where it is colonised by the fungus Penicillium roqueforti that grows in these caves.This system is similar to appellation systems used throughout the world, such as the appellation d'origine contrôlée (AOC) used in France, the denominazione di origine controllata (DOC) used in Italy, the denominação de origem controlada (DOC) used in Portugal, the denumire de origine controlată (DOC) system used in Romania and the denominación de origen (DO) system used in Spain. In many cases, the EU PDO/PGI system works parallel with the system used in the specified country, and in some cases is subordinated to the appellation system that was already instituted, particularly with wine, for example, and in France (in particular) with cheese, for example Maroilles (as most others) has both PDO (Appellation d'origine protégée (AOP) in French) and AOC classifications, but generally only the AOC classification will be shown. Géographica is the French-language magazine of the Royal Canadian Geographical Society (RCGS), published under the Society's French name, the Société géographique royale du Canada (SGRC). Introduced in 1997, Géographica is not a stand-alone publication, but is published as an irregular supplement to La Presse. It was formerly quarterly supplement to L'actualité.The English-language sister publication is Canadian Geographic. Here, There Be Dragons is a fantasy novel by James A. Owen. It is the first book in The Chronicles of the Imaginarium Geographica series. A sequel, followed by several more books, have since been released, including The Search for the Red Dragon (January 2008), The Indigo King (October 2008), The Shadow Dragons (October 2009), The Dragon's Apprentice (October 2010), The Dragons of Winter (August 2012), and The First Dragon (November 2013). Indika (Greek: Ἰνδικά; Latin: Indica) is an account of Mauryan India by the Greek writer Megasthenes. The original book is now lost, but its fragments have survived in later Greek and Latin works. The earliest of these works are those by Diodorus Siculus, Strabo (Geographica), Pliny, and Arrian (Indica). Iolcus (; also rendered Iolkos ; Ancient Greek: Ἰωλκός and Ἰαωλκός; Doric Greek: Ἰαλκός; Greek: Ιωλκός) is an ancient city, a modern village and a former municipality in Magnesia, Thessaly, Greece. Since the 2011 local government reform it is part of the municipality Volos, of which it is a municipal unit. It is located in central Magnesia, north of the Pagasitic Gulf. Its land area is 1.981 km². The municipal unit is divided into three communities, Agios Onoufrios (pop. 475), Anakasia (pop. 1012) and Ano Volos (pop. 651), with a total population of 2,138 (2011 census). The seat of the former municipality was the village of Ano Volos. James A. Owen is an American comic book illustrator, publisher and writer. He is known for his creator-owned comic book series Starchild and as the author of The Chronicles of the Imaginarium Geographica novel series, that began with Here, There Be Dragons in 2006. The northern map turtle (Graptemys geographica), or common map turtle, is an aquatic turtle in the family Emydidae. It is endemic to North America. Oxicesta geographica is a moth of the family Noctuidae. It is found in southern Romania, Austria, Hungary, from the former Yugoslavia to northern Greece and Turkey. It has also been reported from Russian Moldavia and Georgia.The wingspan is 24–27 mm. The larvae feed on Euphorbia species, with a preference for species in the Esula subgenus. They feed in silken webs on the apices of their host plant, causing extensive damage. First instars larvae feed on flower buds and tender leaves in groups of 20-30. Fifth and final instar larvae are solitary feeders and consume less than the other instars. Pupation takes place in a light yellow silk cocoon spun on the stem of the host plant. The Parisi were a British Celtic tribe located somewhere within the present-day East Riding of Yorkshire, in England, known from a single brief reference by Ptolemy in his Geographica of about AD 150. Many writers have connected them with the archaeological Arras culture and some with the more widely known Parisii of Gaul. Phellus (Ancient Greek: Φέλλος, Turkish: Phellos) is an town of ancient Lycia, now situated on the mountainous outskirts of the small town of Kaş in the Antalya Province of Turkey. The city was first referenced as early as 7 BC by Greek geographer and philosopher Strabo in Book XII of his Geographica (which detailed settlements in the Anatolia region), alongside the port town of Antiphellus; which served as the settlement's main trade front. Its exact location, particularly in regard to Antiphellus, was misinterpreted for many years. Strabo incorrectly designates both settlements as inland towns, closer to each other than is actually evident today. Additionally, upon its rediscovery in 1840 by Sir Charles Fellows, the settlement was located near the village of Saaret, west-northwest of Antiphellus. Verifying research into its location in ancient text proved difficult for Fellows, with illegible Greek inscriptions providing the sole written source at the site. However, Thomas Abel Brimage Spratt details in his 1847 work Travels in Lycia that validation is provided in the words of Pliny the Elder, who places Phellus north of Habessus (Antiphellus' pre-Hellenic name). Gustav Reinhold Röhricht (18 November 1842 – 2 May 1905) was a German historian of the crusades. Strabo (; Greek: Στράβων Strábōn; 64 or 63 BC – c. AD 24) was a Greek geographer, philosopher, and historian who lived in Asia Minor during the transitional period of the Roman Republic into the Roman Empire. Syphonota geographica, or the geographic sea hare, is a species of sea slug or sea hare, a marine opisthobranch gastropod mollusk in the family Aplysiidae, the sea hares. This is the only species within this genus, in other words, Syphonota is a monotypic genus. In Greek mythology, the Telchines (Ancient Greek: Τελχῖνες, Telkhines) were the original inhabitants of the island of Rhodes, and were known in Crete and Cyprus. The Indigo King, released on October 21, 2008, is the third book of The Chronicles of the Imaginarium Geographica, a series of books begun by Here, There Be Dragons, by James A. Owen. It follows The Search for the Red Dragon and precedes The Shadow Dragons, which was released in October 2009. The Shadow Dragons, released on October 27, 2009, is the fourth novel of The Chronicles of the Imaginarium Geographica, a book series begun by Here, There Be Dragons. It was preceded by The Indigo King and followed by The Dragon's Apprentice.